William Man was born in 1778 at Reading, Berkshire, the second son of John and Sarah (Baker) Man, and was baptized on 17 June at St Mary the Virgin, Reading. He married Elizabeth Marchant on 27 February 1861 at the Register’s Office, Ventnor, Isle of Wight. 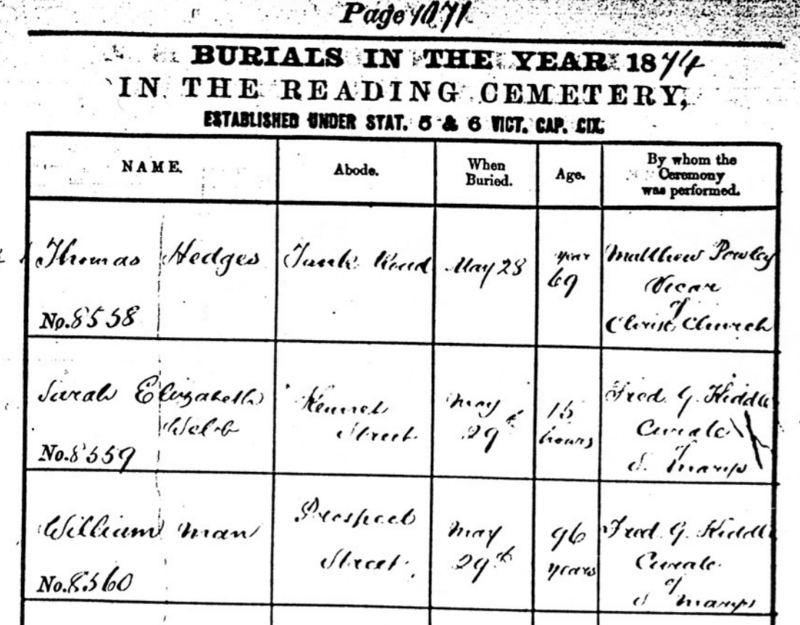 William died on 23 May 1874 at Prospect Street, Reading and was buried on 29 May at the Reading Cemetery. He left a WILL [<— in PDF]. Elizabeth was born in the second quarter of the year 1839 in the parish of St. George-the-Martyr, Southwark, Surrey. She died in the September quarter of 1929 aged 90 years in Christchurch, Hampshire. In 1874 William’s widow remarried a William Agnew Martel, for details on this Martel marriage see the end of this page. William Man has been found on the 1841 census, on the 1851 census and on the 1871 census. 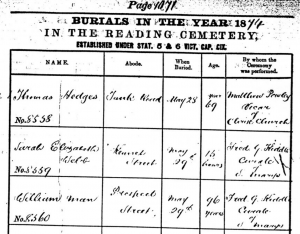 William’s daughter has been found on the 1901 census living unmarried with her twice widowed mother. Her half sister, Mary Agnew Martel, has also been found on the 1901 census. 1807: Gleed, George. Two sermons preached to the young gentlemen of Reading School: At their evening lecture. 1810: Coates, Charles, A supplement to The history and antiquities of Reading, with corrections and additions by the author. 1812: Davies, Benjamin (Ed.). The deity of the Saviour: The riches of Christianity: A sermon preached at the Revd. A. Douglas’s meeting, Reading, on the 1st of December, 1811. 1812: Monck, John Berkeley. A letter to the Right Hon. Spencer Percival, on the present state of our currency with hints for its gradual improvement. 1812: Purdy, Richard (1753-1808). Lectures on the church catechism, the church, the liturgy, and the Pentateuch. 1813: Curties, Marianne. Classical pastime in a set of poetical enigmas, on the planets and zodiacal signs (Printed by Snare and Man in Reading and sold by J. Richardson in London). 1816: Man, John. The History and Antiquities of Reading. 1816: The glory and design of the sacred ordinance of believers baptism: Likewise the vanity and absurdity of the Popish institution of infant sprinkling, briefly considered; together with a few scriptural remarks of some ministerial characters, in a letter addressed to Mr. S. Parrott minister at Salem Chapel, Reading; in reply to a book lately published by him. This small pamphlet can be read here. 1817: Weyland, John, (1774-1854). Three letters to the editor of the Christian Observer, on a review in the journal, of a work entitled the Principles of population & production, as they are affected by the progress of society, with a view to moral and political consequences. (Place: Reading, PUBLISHER: W. Man, Printer,) [Note this and the book below are the only items where William is on his own as publisher]. 1818 Elegiac, Sonnets, and other poems, by T. Wyatt printed by W. Man, Butcher Row, Reading. This is the spot in Reading Cemetery where William Man is buried. As can be seen, there is no gravestone or other marking to indicate this fact, although his name appears on the index of graves which clearly indicates this to be the spot. The cross to the right of where William is buried is the grave of Charles Marchant, William’s brother-in-law. William was still agent for the Globe Insurance Co in 1827. According to the Reading Library and Museum Committee’s minutes John Man’s ‘Anecdotes’ and ‘the three original copper plates for illustrating The Stranger’ were donated in September 1902 by one C. B. Stevens. And in 1931 a plain ‘Stevens’ gave three prints from ‘The Stranger’. One would expect William, having described the Anecdotes as a ‘family relique’, to have tried to keep it in the family, but no relationship between the Man family and the Stevenses has been found. A Dr. Joseph Stevens was first curator of the museum (1884), and George Stevens published directories in the 1880s and 90s. (communicated to the web site by Adam Sowan – Reading historian). The plates and prints were thought lost but a recent (2015) communication from the Reading Museum shows they are still among the Museum’s collection and have the object numbers: 1931.134.1=6. The prints where recorded as given in 1931 by C B Stevens – and so probably the same man that gave the plates in 1902. William Man’s Letter to Edward Garnet Man. The following letter was written by William Man, son of John Man, to Edward Garnet Man. William and Edward would have been first cousins one generation removed; William being the first cousin of Edward’s father Harry Stoe Man. In this letter, William’s recollections are somewhat accurate, however his claims about Admiral Balchen are not since NO relationship, at least not nearly as close as William states, has been established between the Admiral’s family and the London Balchen family of William’s grandmother Mary (Balchen) Man. The journal mentioned by William and kept by James Balchen (NOT a Sir) can be found here. James Balchen was Mary Balchen’s brother and therefore William’s great uncle and he certainly was neither a brother nor a son of the admiral’s. ‘My cousin Ann’ refers to Eleanor Ann Rankin Man daughter of Henry Man. The grandfather William speaks of who dies in Wales is John Man. Dear Sir In reply to your letter received this morning being a total stranger to me, I find many incidents contained in it correct. I am uncertain whether my grandfather, who was a builder, and built many houses in that neighborhood, among others my father pointed one out to me then occupied by the Misses Dolbys built by him at Hurst. I formerly had an itinery written by Sir James Balchen, brother or son of the Admiral who was lost with his ship, of his journey to Hurst to pay a visit to his new relation Mr. Man and his wife, but whether senior or junior I have forgotten. I remember my father saying what a sever blow it was to his family the news of his Uncle Balchen the Admirals loss my Grandmother [Mary Balchen] being the Admiral’s sister. I heard my father say he himself was born in Goodman’s Fields (where probably my Grandfather lived) if so our Great Grandfather might have lived at Hurst. Further than this I know not. My Grandfather as you observed died in Wales. I believe at Cardiff. I have no knowledge of my Grandfather or Great Grandfather having lived in Cornwall. The itinery I mentioned still exists in the Man family. My cousin Ann, who you call Aunt, has made to me the same inquiries you are now making, who is now living at Halstead, Kent, with no better success. Perhaps if you could find the year of the death of our Great Grandfather by searching his will at Doctors’ Commons, it might lead to something further. As noted above William’s widow,Elizabeth, married a William Agnew Martel. The marriage took place on 15 October 1874 at Lambeth, Surrey, five months after Williams decease. William Martel was born in 1876 at Great Yarmouth. William and Elizabeth had one child: Mary Agnew Martel, born in 1876 at Great Yarmouth. William died on 21 July 1877 at Great Yarmouth, Norfolk, at age 37.